The San Francisco Giants defeated the Miami Giant-Killers 6-5 by barely hanging on and praying for dear life. It was a fun, relaxing day at the yard. There were ripple effects on the bullpen. There were waves of joy in the crowd. There were shudders of dread in the ninth. I don’t ever want to see that team again or even hear the word “Miami” for a long time and not before I have swallowed at least three mojitos. 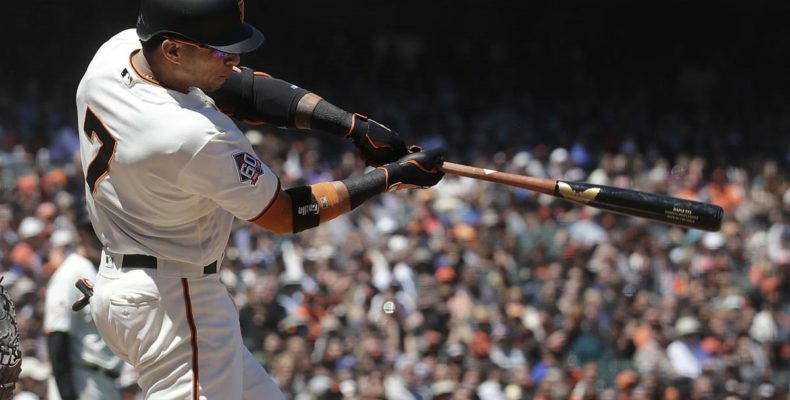 The Giants won in dramatic fashion thanks to add-on hits that drove in huge runs by Hunter Pence and Gorkys Hernandez. BB9 had a big game, including an RBI double. He’s back! The game should not have been this close. Because of Strickland’s injury the bullpen is shorthanded, which has created a ripple effect that led to Reyes Moronta striking out a fish for the final out with the tying run on second after two runs had already scored in the top of the ninth. An obviously gassed Sam Dyson could not complete the inning, thanks in large part to a double that should have been a routine out but wasn’t when Gorkys, God Bless his soul, lost the ball in the sun. Disaster ensued. Gorks did have what I consider the most epic at bat of the season. He fought off pitch after pitch and saw 14 in total before singling in a two freshly-minted runs with two outs in the five-run sixth. The Giants until that point, had been mowed down like little lambs at the slaughter by Mr. Urena, who was pitching like 2000 Pedro Martinez. All of a sudden, a walk, a key hit by Kelby, and some gritty at bats led to a fateful inning for the hometown heroes by the bay. Derek Holland pitched another very solid game matching Urena’s zeroes mostly, except for one run in the second. Mr. Holland is not exactly throwing opuses every time out but he his keep the Giants in games and has proven to be a life-saver for the starting staff. He deserves a lot of credit for minimizing damage and demonstrating veteran leadership in the process. 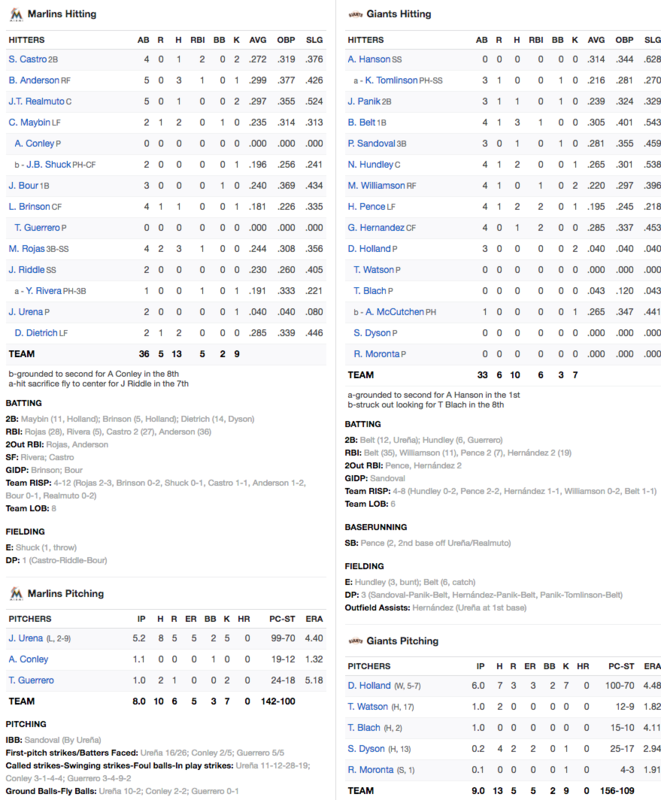 The Giants turned three double plays. This B-team line up suffered an early blow with Alen Hanson’s exit in the bottom of the first inning after fouling off a pitch on his knee. The victory gave the Giants a 27-28 record. Tonight Mr. Bumgarner pitches against the Padres of San Diego. He will be pitching for his first win of the season.